Ralph: So this month we’re going to start things off with another guest. We have an adjunct professor from Carroll University who teaches English primarily to freshman and her scholarship focuses primarily on the connections between students and teachers in education especially in higher education. Let us both welcome Delores Greenawalt. Greenawalt: And? What’d you think? Woodruff: I feel good about it. Relationship building is a really important part of classrooms. Where it’s neglected, student’s do not feel invited to participate. That is something that we definitely feel. I’m a high school instructor so we definitely feel this at the secondary level. I know that it’s an important part of primary school education, but as class sizes get larger in the post-secondary environment and tthe specialization of the instructor increases, the knowledge gap between the students and the instructor itself, there comes these barriers with that relationship in the post-secondary level. To see something specifically discussing relationship building at the post-secondary level was refreshing. Ralph: Your article started off with a personal perspective on it. Can you tell us about just your personal experience with relationship building either it be as a student or as an instructor? Who are you as a person in the education space? Greenawalt: I am a peon in the education space. There is one thing that I love. One of the reasons that I love teaching is the connection between me and the students. I feel that a lot of that connection can be lost, especially like you had said when that knowledge gap becomes larger and larger. I think that we have to get back to connecting to these students because it’s really the reason that they come. They come to school, of course they want to learn, they have an end goal, right? The end goal is, “I’m going to graduate,” and then they have this magical number of how much they think they’re going to make after their 1st job. 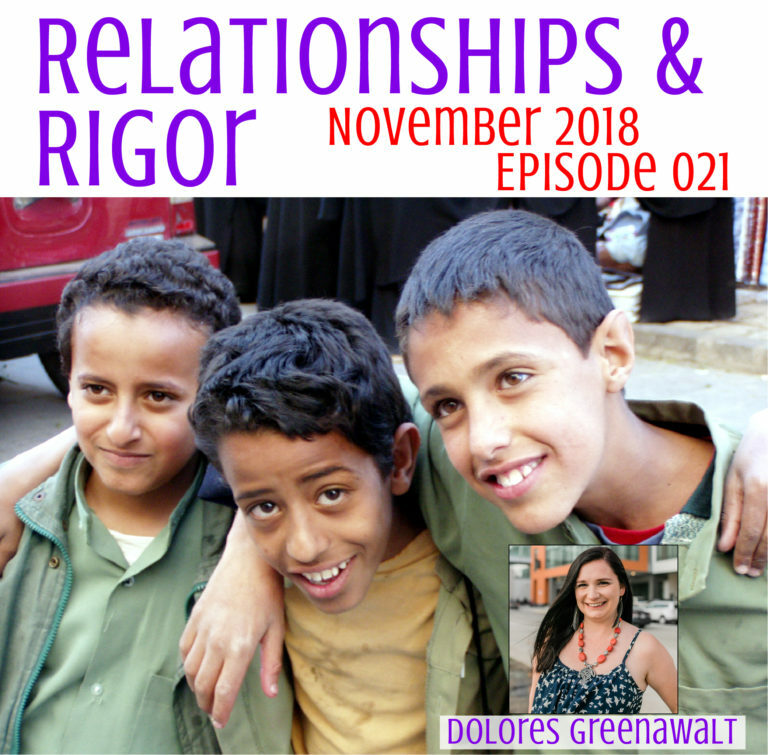 It’s our job to kind of sit back and say, “OK, yes, but what are the steps to get there?” By doing that, by creating a relationship with your students and actually getting to know them and having that safe space in the classroom they’re more apt to keep coming back, keep learning and actually want to make an investment in their education. For a lot of the students I work with at Bryant and Stratton, it’s difficult to build that connection because there’s not a lot of people that have experience that type of a population. The socio-economic discrepancy, the race differences, the fact that a lot of these students have not experienced school where there is active learning, a lot of them have gone to high school and have done poorly, don’t have support at home, don’t have that side where education is truly important. I think that it’s important to remember that when you are working with different types of populations because it’s going to change the way that you communicate with them. Ralph: What are, even just broadly, maybe you don’t have the numbers, but what are the demographics of Bryant and Stratton college? Ralph: That’s us at KU. We are primarily Caucasian. Greenawalt: Yea. So my population is different. I deal with a different type of population. I deal with a lot of students who grew up where education is not the main thing a lot of them come in after they have been working for a little bit or perhaps they have already started their family and they want to come back and get an education. But mind you, they’re still young students. They come from high schools that didn’t necessarily prepare them for the rigor that college requires. Woodruff: How is that different or reflected in the demographics of the faculty? Greenawalt: That’s a googd question. Our faculty, we actually have a pretty diverse faculty. We really really do. It’s primarily Caucasian, but we do have a lot of African-American faculty as well. That’s demonstrated and I feel like that also helps that the students and the population because sometimes see someone who looks familiar and we all as humans make assumptions and biases about people. I think they’re well represented, which is also nice. Although, I still think that every faculty, and every campus could be a lot more diverse than what it is. Ralph: How do you feel that has come to be? What steps do you think administration or department heads are taking to you can have the better representation? Greenawalt: I think a lot of it comes down to supply and demand. The more people that graduate, the more people that we can hire. Bryant and Stratton, the nice thing about it is it’s a career college. We have a lot of faculty that still work in that field, and then do a lot of adjunct work, which is nice because the connections are there, and the networking is there. Just having that built-in,we bring in a lot of diverse people. Woodruff: That is very different from my experiences in the high school that I work in. I am aware off the top of my head, 2 African-American instructors, and our demographic population of students far more diverse than the population of our of our faculty. Greenawalt: How do you think that affects your teaching? Woodruff: Ooooooooooh. Affects my teaching?! That’s good! I have kind of been thinking about how does it affect the experience of my students, but then how does that affect me personally in my classroom? That’s awesome! My fist thought is that the further the cultural gaps there are between the instructor and the teacher, the more work has to consciously be put in to closing that space to build that relationship. We are safe where we are familiar, so when we are in an unfamiliar place we’re not safe and if we’re not safe then we’re not to be able to hit those higher order thinking stresses. Because this is the case, I have to work harder. It’s an obligation that I have to build those relationships. Ralph: If what you’re doing in the classroom is so far removed from what you experience elsewhere then is it more artificial and it makes it less natural. If I’m having more authentic interactions and more healthy interactions with people of different cultural backgrounds in the other parts of my life, even like faculty interactions, if all I ever do is interact with people of my background, then when I’m trying to build bridges to people of different backgrounds in my classroom that’s more strain. That’s more contrived because it’s further removed from the rest of my experience that just necessarily I am less practiced at it. Versus, if it’s more integrated in the other parts of my life, I am used to working with people with different experiences, then in my classroom, I am more used to working with people with different experiences. I think it’s one of those things that we mentioned, synergies, I think in the next segment, where it interacts with each other make each other better. When you do other pieces and more pieces are in place, then they all become more effective. What has your experience been? Greenawalt: For me, I am first born. I am 1st generation American. My primary language, my first language was not English, which is probably why I stutter a little bit while I talk. My primary language, it was Croatian. I didn’t realize even lived in America until someone told me. Had no clue. I didn’t understand. I didn’t realize that I was speaking a different language than anyone. The neighborhood that we grew up in was a very diverse neighborhood. There was African-Americans, whites, Mexicans, Latinos. I mean we had everyone. My experience in general is different I feel than my husband who grew up in a very nice suburb, mainly white children. Meanwhile I’m listening to Tupac driving down in a wagon, bringing everyone in. That whole experience, I think also makes it easier for me to connect to the students because I understand. I have been there. I understand that understanding of the subject. I understand being the odd man out. I understand the need or the wants to fit in more so than worry about the education right away. I think a lot of that has also helped me kind of discover just how big that gap can be in the classroom from instructor to students. I haven’t lost a lot of that. I’m still am very close to my roots. I see things in a different light and I think that that does offer me a slight advantage, which is nice. Woodruff: In this article you paint a picture of some beginning-of-the-year activities that specifically engage in for some relationship building with your students. Can you, for those that haven’t read the article, can you paint us a picture of what those activities are like? Greenawalt: When students first come into the classroom and they said down I like to kind of take a look at everyone and see how they’re responding. Is it automatically on their phone? Is it talking to people next to them? Do they pick the seat that’s closest to the board? Do they pick the seat all the way to the back? Once class starts, I do introductions, and we all have those, maybe not at high school, but in college, those awkward, “who are you and what do you want to do you when you grow up?” type of introductions. I specifically let the room get silence after everyone is done doing those fake introductions and I let the let it sit there for a few minutes. The reason that I do that is because eventually people are going to feel awkward sitting in complete silence and then they start talking. Then they see engagements. All of a sudden these walls are slowly being let down because they begin to see what they have in common with the person next to them, or the person across the row from. I think that it’s an important piece because I can also sit in and listen and join them in these conversations and all of a sudden I come in and we agree about something, or I mention something that they’ve been talking about. All of a sudden the wall starts slowly tearing down, even more. Which I think is important. Woodruff: One of the things that I like, I caught that in what you said there, is an under utilized, and an underappreciated technical teaching skill and that is wait-time two, waiting after they have asked the question and that you’re saying hey we asked this question we do these introductions and then I just wait. I don’t say anything. I let them stew in their own answers until the environment changes. I’m actually working on wait-time-two in my class right now. To hear this narrative, where it’s an important part of our introductions because it changes the way the classroom feels, that’s a good reminder that I’ve got to keep working on that. Ralph: The piece that I picked out from your comments is time. I’d invest time both in the wait time, but then also in letting the conversations occur, and mature, especially from an organic standpoint that they don’t just happen, even in a 2 or 3 or 5 or 7 minute block. I have to commit to that as a priority. What kind of payoff, what kind of benefits, do you see in the rest the class of the rest of semester that help you justify that time investment early on? Greenawalt: The relationship between the students themselves. They come in and a lot of them don’t necessarily have the support that you would normally see at a d1 or d2 school, from family members, or perhaps they come in in the very hesitant about attending school to begin with, but if you can connect with someone, then there’s a little bit more of a reason to show up, right? “Oh, I really like that person and we were talking about this or that. I wonder what they’re going to think about this if I come back in. I wonder if they listen to the new album and maybe we could discuss that.” I think that slowly it starts off like you said, It is very organic, it is very small. As a semester builds on, now all of a sudden we are not just talking about hobbies an interests, but we’re talking about assignments. “I didn’t have a chance to do this. What did you get for that? Do you remember what she said we were going to talk about?” As they continue to build relationships with each other, then I come in and I start to build these relationships as well, talking to them, conversing with them, saying, “OK, look. Here’s what we’re going to do next week, this is why it’s important to come in.” and they feel a little bit more comfortable as well and again continue to show up. The biggest drop off is around week four. At least in my world, in the college world. It is around week four we start to see the attendance kind of go down. It’s always a question of why? What happens? What’s the difference? A lot of it is, I believe, the newness has worn off, so now it’s not so much fun anymore, but there’s actual work. If you don’t have these relationships tto say, “No you need to continue to come to class, or come with me, or let’s go grab lunch afterwards,” or whatever, there’s no reason for them to attend then. It’s kind of like me and working out. I need a motive. I’m not just going to do it. I want to know why I’m doing it or who else is going to be there. Woodruff: Can I ask you a couple of details about your work scenario? How often do your classes meet? How large are your class sizes? How many weeks do your classes meet? Things of that nature? Greenawalt: Bryan and Stratton is a traditional college. There are 3 semesters instead of two. It is in a trimester. Classes meet anywhere from one time to 3 times a week. It is more on a credit hour versus anything, so 3 hours a week. But otherwise than that it is pretty typical of any D1 or D2 school. Class sizes averages from 18 to 24, so it is maxxed at 24. Greenawalt: I can imagine. What are you at right now? How many do you have any classroom? Woodruff: I’m about 27 student average. It’s actually a little lower this year. I was hitting 30 in most of my classes last year. I don’t know I’ve got a good year. Greenawalt: That’s a lot. Do you have any teacher aids? Woodruff: In one of my classes I have a support staff, yeah. I have a para in the room for one of those 5 class periods. Greenawalt: I feel like that’s hard. When I have 24 students in my classroom it’s very hard to keep track of everyone and see where everyone is. How do you manage that? Woodruff: Well, our situation is different in that I have contact with them every day. I have a two semester system so generally the kids that I have first semester I also have second semester. We really have to play a long game. I actually do start my school year with some strategies that paralleled some of the things that you did in your in your writing. One of the things you did is you have them do some writing about themselves and I also do that and an addition to helping me get to know them better, there’s some secondary benefits of that. Sherman et. al, this is from 2013, wrote an article called “Deflecting the trajectory and changing the narrative. How self affirmation affects academic performance and motivation under identity threat.” Big title that basically says that when students get an opportunity to write about what’s important to them and why it’s important, they feel more valued and are more confident about their participation in their class. The strength of that value increases for students that have possibly underprivileged or disenfranchised demographics. I do something like that at the beginning and I saw that you did something like that too. I have to use that extra time that I have, start the relationship building game very very early so I can get us to as many of them as I possibly can. What about you Ralph? Ralph: I play the relationship game on easy mode because I am a later course in a program. In our program relationships with the student is among the top priorities. I know every student who walks into the room before the first day of class. I am fighting that battle long before I could possibly even start my content objectives, so it’s not really a problem, because it is a problem that we deal with early on and that we prioritize with time outside of class for all the things we do. Really this is just a result of me praising my boss because our director makes a sufficiently high priority that I get to invest time outside of class doing it. This is one that I’m really happy with actually with how we do. So I’m thinking about faculty, whether they be high-ed or secondary, but folks who have content expertise and curricular objectives that are sufficiently complex that they feel compelled. I don’t know that I have a day or a week to contribute to other stuff with air-quotes, because I’ve got to get started talking about Biology, or English, or social studies, or geography, or whatever it is. The question is something akin to how does this relationship building get woven into the later parts of your semester when we’ve got to work on composition, or, I’m sorry I don’t actually know, is composition a thing you work on or is it literature? How do you weave relationships into the things that you’re doing later in the semester when you are also working on constant mastery? If this is going to matter, if it’s a priority for the long haul, so how do you work it in after you stop devoting all of your attention to it? Greenawalt: I think I love this question because I feel like so many teachers have that question right? Why should I get to know my students if in 16 weeks are just going to move on. I feel that the whole relationship aspect to something that’s been truly brought up in the past couple of years, and the need for it and yadda-yadda-yah. But, how do you take a look at the assignments that you’re going to do in the future? If you know that students are going to have to write a paper, which for me, they are going to have to write a paper. I tap into their interests. Within their interest I ask them, “OK. How does this relate to the work force?” because in my world, in my classroom I don’t want to do assignments that don’t have an end cause. I don’t want to grade stuff that doesn’t matter. These students don’t want to do stuff that doesn’t matter. They truly have lives outside of class. How do we create assignments or what kind of assignments can I create that will lead into the future? If everyone has to write a paper, think about what your major is, and think about something that either interests you or think about something that can help you after you graduate. Let’s take a look at how to properly write an email. Let’s take a look at how to, heaven forbid, spell out all of your words instead of writing the letter C and the letter U. Let’s take a look at how grammar can actually affect the way that your workforce looks at you when it comes to promotion. Let’s take a look at how different types of subjects mean different types of things. I let them choose what their topic is versus hammering into them, “Here’s what you have to do. This is what you have to write about, and there’s no room for anything else.” I’ll change the assignments. I’ll take a look at the prompts that we read. I try to find things that happen to be important right now. Subjects that the world is discussing, because it brings in a whole different type of a conversation and then you really truly get more of their opinions, more of their thoughts, and they begin to look at it in a different viewpoint as well. Ralph: It sounds like the confluence of autonomy and authenticity is really the two things working together so that’s going to be different semester over semester and for any group of students. If you’re really actively listening in those first couple of weeks it can be done. As a matter of fact there’s a professor from whom I’m taking a course who is working on the doctoral level, and he doesn’t finish the syllabus until the second week because he takes all that introductory information to define what the course is going to be. I kind of take that as sort of a proof of concept. There’s no such thing as too advanced to be relevant and to be applied to the experiences of your students. There’s no such thing. Everybody can do it. Greenawalt: I agree. The latest thing that I just, actually on Thursday, had my students read an article that was in the New York, either New York or New York Times, I have to look it up, but it was about Stone Mountain, if you’re familiar with Stone Mountain. So it’s a tourist destination, but there’s a carving within Stone Mountain and it’s of three confederate soldiers and they have their hats off and they’re basically saluting the Confederate flag. The whole question is, do we take it down? Do we carve over the carving? Do we add to it? What do we feel? Are we just respecting a population? Are we offending people? By eliminating it are we eliminating history? I made them read the entire article and then afterwards we had a discussion and I incorporated it with the discussion that we had to do online, on black-board, because there is a requirement to do a discussion on black-board. As they were taping these up, we talked about it as a class. I wanted to hear what their thoughts were but I wanted them to keep referring to the article. We filled in that E.P.A. and the Emily standards, we talked about referring to information rather than just spinning off your opinion. We discussed how it’s important to go back to the data that you’re reading, go back to the research that you’re looking at still you their help your opinion or help define what you’re trying to say. You can still say, “Yes, I’m offended,” or, “No, I’m not offended,” but use something to back yourself up. Show us the research because that’s what you have to do in the workforce. You can’t just say these are my thoughts and I’m done. Ralph: This might be too much about a memory taxing question, but do you have an example perhaps of a past semester that predated this writing when you did maybe have different prompt for the same objective? Can you share any examples of how this or another assignment has been responsive to different current events as current events have come and gone? Ralph: Thank you so much for your time. This has been a very enjoyable discussion. We’ve got both of your papers linked on the show notes for anybody who wants to get a closer look at your comments. Again this is been wonderful so thank you and keep excelling up there, our neighbor to the North. Thank you so much Dolores Greenawalt. Greenawalt: Have a good day. Thank you.